Nightlife has put Belgrade on the map as one of the world's prime destinations. Due credit for this should be given to Belgraders, their warmth and energy, and the positive vibe they send, that will instantly make you feel at home, as if among friends. People go out on all nights of the week, on the spur of the moment, with blithe disregard for the amount of work that needs to get done the following day. The most exciting and busiest nights out on the town are not dictated by the day of the week but by chance and circumstances. Belgrade has something to appeal to everyone's taste (be warned, however, that all types of drugs and prostitution are banned), and venues with live music are particularly popular. Cafés are open until 1 or 2 in the morning (those located in residential buildings have to close at midnight), clubs until 4-6. Some cafés host dance events and there is a vibrant argentine tango and salsa community. Depending on your inclinations, the evening can start already around 8 pm with a theatre show or dinner in a restaurant, or around 11 pm with a drink in a café to set the mood, followed by a night of crazy partying in a club or splav. People go clubbing after midnight and stay until the wee morning hours. Fortunately, most bakeries are already open by that time, and a weary reveller can refuel with a calorific burek, still hot from the oven. Admission to most clubs is free, and if a fee is charged, it does not exceed 5 EUR. A tie is not required anywhere, although you may be refused entry to some clubs if you are wearing trainers or are under the age of 21. When Belgraders get blown away by a song, they climb on the table to dance as if spellbound, and a girl who was giving you the cold fish eye a split second ago might melt and leap into your arms. Most Belgrade clubs close their downtown venues between June and October, when the party moves outdoors and to the rivers. The floating river clubs or splavovi are the defining feature of Belgrade’s nightlife in summertime. There are about a hundred splavs, varying in shape, size and music they play. Their location away from the residential areas allows for parties to go at full steam until dawn. Some look utterly abandoned, but they may still be hosting wild parties from time to time, with admission by invitation only. For a night out on the river, there are also sightseeing boats for hire, providing catering and entertainment. They will pick up the passengers around dusk, and take them for a cruise along rivers deep into the night, or at least while the store of fuel and high spirits last. The hottest international music stars and DJs head to Belgrade and there are concerts and themed parties all year round, hosted by Kombank Arena, Sava Centre, Dom Omladine, SKC, KPGT and some other less formal venues. At the entrance to some nightclubs, bouncers may give a pat down to suspicious-looking males or search the bags of females in their company. If you are set on going to some of the more popular clubs and have no reservations or are not on the guestlist, you will spend some time waiting in a queue to get in. This particularly applies to floating clubs (splav), where the capacity is limited by a club buoyancy. A free booking will get you only a place to stand at a bar, and if you fancy the comfort of your own booth, the reservation will set you down a bottle service fee. There are no long toilets queues for snorting drugs, patrons are generally conservative in that they prefer to boost the spirits with super strong liquor. Although incidents are few and far between, it is not a good idea to ogle brazenly someone else’s girlfriend or boyfriend, no matter what their looks. If you somebody lashes out at you with "Shta meh glehdash?" (Why are you staring at me? ), it is time to walk away, calmly and quickly. You will find the atmosphere commonly associated with r'n'b or house music videos in the nightclubs playing "turbo folk", a local mix of MTV dance beats and Turkish pop-folk performed in Serbian by scantily clad females. Serbia has a rich music tradition and Belgrade offers a variety of traditional ethnic music subgenres. Live bands in kafanas could be of the type that plays urban folk music (guitar, violin, double bass), tambura bands (tamburas, guitar, double bass), brass bands (trumpets, drums)... Bands in kafanas typically go from table to table, playing for the patrons and creating an intimate yet rollicking atmosphere. The band takes song requests from patrons for a tip and the time it hangs about a table is in direct proportion to the tip they receive. The special treat is when the violinist plays softly in your ear. Gypsy bands, whether brass or tambura bands, make for a special experience. They can deliver everything from Frank Sinatra to traditional Serbian music, under all circumstances (and weather! ), to allay the sorrow or swell the joy. Gypsy trumpeters are mostly self-taught and they do not so much as play their instruments as they coax them to speak, shriek or wail. When they feel sad or happy, Serbs can sometimes behave irrationally, even when it comes to music. Some kafana patrons will be happy to spend far more money on music than on food. They will make the musicians play on the table, under the table or “on TV” (in this case, the band goes out the door and plays just outside the open window, framed by the window box). Musicians are well rewarded for their pains - patrons push money down their trumpets, paste it onto their guitars or their foreheads sticky with sweat. Anyhow, it’s hard not to have good time in Belgrade. Fast: Donesi vina krčmarice - Alewife Bring the Wine (where all village lads are smitten with the pretty alewife and ask her to bring more wine, rosy red as her cheeks, to drown their heartache), Moja mala nema mane - My Lass Is Without a Flaw (where a lad praises the beauty and kisses of his sweetheart and claims that she loves only him and nobody else), Kad je deda lumpovao - When Grandad Was Partying (about a rakish grandfather who loved to party and dally with waitresses, and sent flowers in baskets to his wife before going home), Reših da se ženim - I Mean to Get Married (where a lad is trying to persuade a lass to untie her hair and unbutton her shirt promising he won’t tell anyone about their love making and would marry her), Kad sam bio mlađan lovac ja - When I Was a Young Hunter (about the amorous adventures and great life of a young hunter)... Slow: Bolujem ja - I’m Heartsick (about heartsick lovers whose love is doomed), Govori se da me varaš - People Talk You’ve Been Unfaithful To Me (where a man, gravely ill, tells his lover he has heard people talk she is cheating on him, and entreats her to lie to him that she still loves him and spare him the heartache), Ima dana - There Are Days (about a love so overwhelming it gives you pain), ‘Ajde Kato ‘ajde zlato - Come on Kate, Come on Honey (where a fine gentleman asks pretty Kate to go out to pick celery (!) in the middle of the night, but she refuses saying there is no moonlight and it is too dark, so he promises to bring lanterns and makes lame rhymes with her name), Mito bekrijo - Mita the Carouser (where a lass is standing at the window late at night, waiting for her love Mita to come for her, as he had promised, and Mita is on a drinking binge in kafana with his mates. She even promises she will take care of his old mother if he takes her home), Dimitrijo sine Mitre - Dimitrije My Son (where mother is talking to her only son and calling him a fool for not seeing that his wife is playing around, but he does not care as she is gorgeous)... Special: (with the opening lyrics, glasses get smashed on the floor): Šta će mi život bez tebe dragi - What Good Is Living Without You My Love. 20/44 (Soul, Funk, New Wave...), Play (House, Pop...), Freestyler (Disco House, R'n'B...), Povetarac (Funk, Reggae, Rock...), Plastic Light (R'n'B, House...), Sound (House, Dance...), Lasta (House, Dance...), Blaywatch (fancy disco, local Pop & Turbo Folk music). 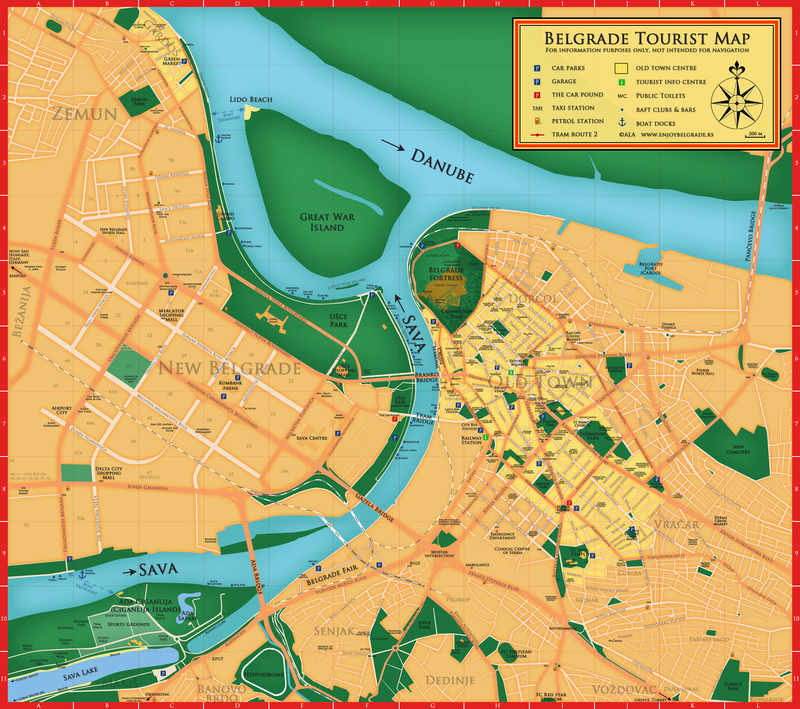 Check out their FB pages for events, and our map of Belgrade for locations. Some floating clubs are open only during summer season (June - October). Bulevar Nikole Tesle 3 (ex Hotel Yugoslavia), Tel: 2202-800 (casino), 2202-822 (restaurants), www.grandcasinobeograd.rs. Map D4 Open: Mon-Sun 14-06. Grand Casino perched on the Danube shore has everything it needs to please both those passionate about gambling and those merely curious, looking for good fun. It features American Roulette, Black Jack, Texas Hold'em, Omaha poker, Slot machines, VIP Club, 3 restaurants, bar, appearances of music stars and other events. Entrance is not allowed to anyone under 18, and while dress code is casual, sportswear, shorts or flip-flops are banned. Entrance is free, but subject to registration, which will require you to produce the ID or passport. Info on concerts and venues with live gigs - here!